Sceloporus undulatus undulatus, also known as the southern fence lizard or fence swift, is a common sight in many Florida landscapes. It occurs in pine flatwoods, hardwood hammocks, and longleaf pine-turkey oak habitats. They can be found in the home landscape climbing on fences and trees, basking in the sun on rocks and logs, and searching for food on wooden decks and garden borders. 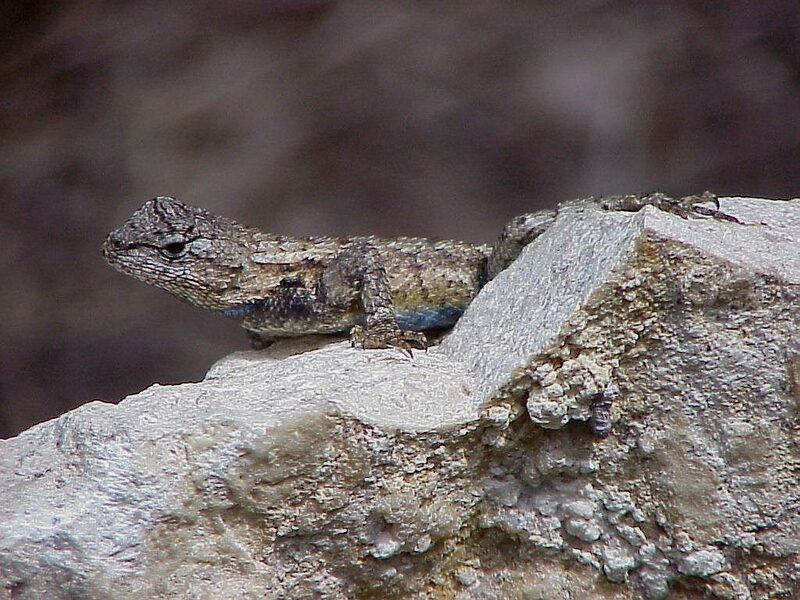 The southern fence lizard is approximately 7 inches in length at maturity. It has a rough scaled body that is gray with wavy patterns of black and light gray along its back. Undulatus refers to the undulating or wavy pattern along the back. Mature males may not have the prominent patterns along their backs, but they do have brilliant patches of metallic blue along the undersides of their bellies and throats. Males can be seen doing pushups to show off their blue undersides during mating and territorial displays. Color variations give rise to individuals that may be gray to brown with heavy markings to little or no markings. Their coloration affords them excellent protection from predators especially when they are foraging on the bark of trees. The dark wavy patterns closely mimic the fissures found in the bark of oaks providing them excellent camouflage. Southern fence lizards are diurnal and can be found hunting prey throughout the day. Fence lizards do not run after their prey, but rather sit and wait for it to stroll by before they pounce. They can often be found clinging to the trunks of trees facing downward waiting for their prey to venture along on the ground in front of them. Their diet consists of ants, crickets, grasshoppers, spiders, centipedes, snails, beetles and other insects. Ant hills are also a favorite hunting ground. If you catch this lizard by the tail it can easily break off and will continue to wiggle in your hand while the tail-less animal gets away. This is a sacrificial defense mechanism that allows the lizard to elude capture. The tail will regenerate in time. Breeding occurs in early spring. Six to ten eggs are laid in a shallow nest at the base of a clump of vegetation or a rotting log. Sawdust piles are favorite nesting sites. Eggs begin to hatch in early June and throughout the summer months into early fall. 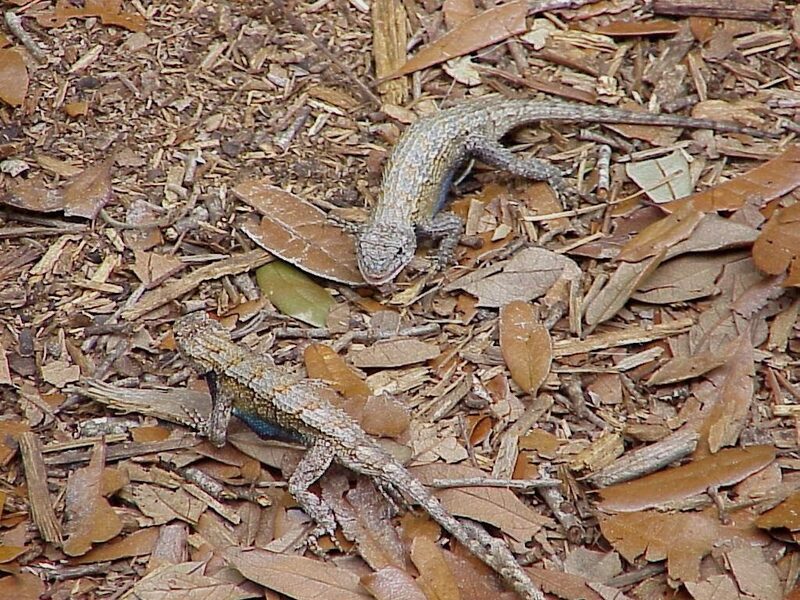 The Florida scrub lizard (Sceloporus woodi) is very similar in appearance to the southern fence lizard. However, it is distinguished from the fence lizard by its habitat and coloration. The scrub lizard is found only in scrub habitat. 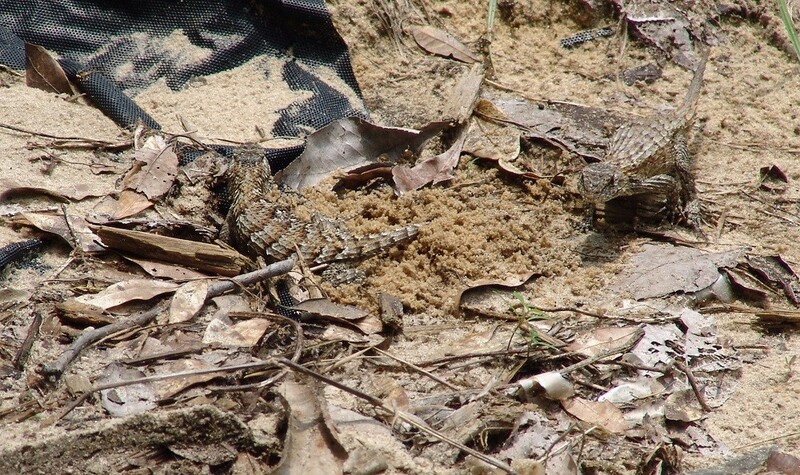 Young scrub lizards have two rows of thin zigzag bands on their back, and brown stripes running lateral along their bodies. Adult females retain the dorsal zigzag pattern, however, the dorsal pattern fades in the adult male and then only the lateral stripe is seen. In areas where both species occur they may hybridize, which complicates proper identification.